Click to see – Latest WBCS Recruitment Notification 2017 Vacancy. WBCS is a dream for every govt job aspirant who want to establish their selves as state civil service cadre in West Bengal. Here we will start about a brief discussion on exam pattern and later we will see the preparation tips and exam strategy including a recommended book list required to clear the preli exam. If you are preparing hard for WBCS and want to know which books to study for preparing the preliminary and main exam, then this article is for you. West Bengal Civil Service is conducted by WBPSC that is Public Service Commission of the state. There are total 4 groups in which the recruited staffs get posted. Those whose places are on the top of the merit list, get their posting WBCS executive where they join as BDO or Block Development Officer. Obviously the exam is quite tough but comparatively easier than IAS. Here we will only discuss about the prelims and preparation tips to clear the exam. This written objective type exam consists of 200 marks question from 8 different subjects. Details about the preli syllabus and recommended book list has been given on next para. Each question carries 1 mark and wrongly answered questions will deduct 1/3 marks. Answers have to be given in OMR sheet. You will be given 2.30 hours to answer those 200 MCQs. So, you have to be very quick marking the answers in OMR sheet. Indian History (25 marks) and Indian National Movement (25 marks) – “Bharoter Itihas” by Dr Atul Chandra Roy. This book is in Bengali Medium. New candidates can read this book thoroughly from the first page to last page as to gain the basic knowledge. Once finished you can read History book from “Tulsi Publication”. General English (25 marks) – Objective General English by S.P Bakshi (arihant publication). Again this is a book for beginner. Once you complete this you may study P.K De Sarkar for English Comprehension. Current affairs (25 marks) – ‘Pratiyogita Darpan’ magazine publishes latest national and international articles in very smooth language which will help you in English vocabulary a Besides this you have to study newspaper regularly to get in touch with latest happenings. We also have a current affair section which is being updated in frequent intervals. General Mental ability (25 marks) – Quantitative aptitude and Reasoning books by R.S Agarwal. Indian Polity & Economy (25 marks) – Indian Polity by Laxmikanth. If you read this book from the beginning then you don’t need to study others. For economics Ramesh Singh (Indian Economy) is a good book to study. General Science (25 marks) – Chronicle Science books and NCERT books are easy to read and also self-explanatory. Geography (25 marks) – NCERT geography books from class VI to XII. This will cover from Indian, World geography and physical geography West Bengal’s geography can be studied from Class VI geography book of Bengali Medium Schools. You may also visit our GK MCQ Section for subject wise Question Answer. Read the books mentioned above and don’t think that this is an exclusive list. Study more books which you find handy. One more thing, read these books again and again once finished. Revision is the key to get success in any civil service exam be it state or central. Study every day to get in track with preparation and never lose hope. Other information regarding WBCS can be found on www.pscwb.org.in. No, b.a first year can’t appear. I’v made a spelling mistakes in one time registration , whether it’s a problem ??? please tell me a little bit about it. Thank you for providing complete book list on preliminary preparation. Please provide some free sudy materials. currently i am pursuing my M Sc. in maths . I want to write my wbcs exam in the year 2019. currently i am solving quants by rs agarwal and some grammar. So once i finish this how to go ahead .. and can u share some link to download some books for the preparation. How many months before the preli is needed to read for current affairs? Thanks for providing Valuable Info. But, Can you please suggest me the Best Books for WBCS Exe. Examination written in Bengali Language? According to your post, Now I am aware of Good Books written in English. But, I also need to know Best Books written in Bengali Language for Each Subjects. I appreciate your work for providing me with all kinds of information but can you please tell me an english book for history (for prelims). And can you also suggest one book for geography? You can study Bipan chandra and NCERT for history, and ramesh singh’s book for geography. But remember these books are for detailed study and gaining in-depth knowledge about subject which may also help you in mains. If you need books for only prelims, you may go with any General Knowledge books & questions banks of standard quality available in market. Meanwhile you can look at Geography MCQ & History MCQ quiz. How can i prepare for both i.e.ias and wbcs.i meant is it possible to go through a list of combined book?? Combined book is hardly available in Market. Approach of preparation of both the exams are quite different specially for mains. 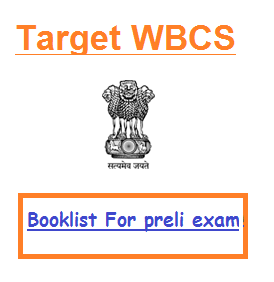 You can see the book list for WBCS prelims here. We will provide IAS recommended book list & exam guide very soon. Suggest books for polity and economy and history that can be helpful both for pre and mains. Hello Ma,am…..I want to sit for WBCS 2018 EXAM….IF I study Tata MC grawhills General studies manual for GS section,is it sufficient for WBCS prelim? Please also let me know how about studying RS Aggarwal’s gk book for GS section. McGrawhill is UPSC level book. WBCS prelims preparation is far different. You should go with the standard books as mentioned here. McGrawhill is definitely an outstanding book but for WBCS prelims, it will not help you much. Admin plz told me in wbcs main exam question paper’s will make in which language？Bengali or english. In both English and Bengali except the Language Papers. except bengali paper .I mean gs paper 1.2.3. and paper 6 will be in english language. I.guess 30-40% of the paper is repeated every year. Moreover compared to civil services (all India) there is a bit diversion. Medieval India part is being asked in wbcs which is almost nil in CSE. Date line type questions also asked in wbcs. In IAS exam,no ques of date. Here in wbcs names n personalities are being asked,books m authors,in IAS its purely from “The Hindu”. So adjustment required. Exactly. You have provided nice insights of the two. I want sit in WBCS exam in 2018. My DOB is 16/01/1986 and I belong to OBC- A category. I want to choose Mathematics as optional paper. But I can’t find the latest previous questions papers of this subject. How can i get it as pdf file. We will soon upload the previous years optional paper subject wise. I am btech eng.my dob is 2.8.1980.can I apply for wbcs exam. Yes you can apply, but you need to check your age relaxation according to your category. Recommend few books on history optional…..and suggest how to make preparation on this subject.please suggest me……I am deeply worried about it….. This year i have just completed my graduation in english … And now i m really very interested for civil service examination. So how can i prepare fr this. you need to strictly follow the syllabus and need to make your own preparation strategy for the exam. You should solve previous years question paper and adhere to the standard books. Consult with the senior aspirants and also do follow our wbcs related posts. hlo maidam how can i downloading my admit card for wbcs preliminary which is held on 29jan of 2017 and i have a problem mem when i downloading my admt crd its shows no match so plz kindly tell me what should i do? & how get my card. Was your payment successful?? you can check this by visiting the WBPSC website and after logging in, you will be able to check the status of your application.